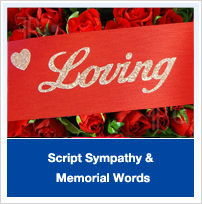 Colorco comforting Script Sympathy & Memorial Words are available in Standard Size for a # 16 ribbon and Petite Size for a # 5 ribbon. Our product line offers your customer the widest variety of sincere and concise messages to pay respect and show love to those who have departed. Colorco was the first to custom design and create adhesive Script Words that are extraordinarily Beautiful, Dignified, Easy to Use, and that can be Read from a Distance. Most importantly, we wanted to produce a script product that didn’t require glue or staples to stay on the ribbon! The result is an Elegant product that is cost effective for you and your customers and that will enhance the beauty of your sympathy arrangement, not detract from it like other products. The traditional gold color is refined here by using a softer golden-sand look appropriate for the service. Opal or Silver provides another very beautiful color option. Professional Florists tell us that Colorco Sympathy and Memorial Words and Letters are undeniably the best choice for Beauty, Functionality, and Value. You will love this product for sure!